The Thrive Diet was created by Brendan Brazier, a professional Iron Man Triathlete who fuels his training and performance on a vegan, predominantly raw food diet. It is designed as a long-term eating plan to help athletes and physically active people to develop a lean physique, enhanced endurance and improved mental clarity. This vegan triathlete diet includes a 12-week meal plan with recipes as well as exercise guidelines. This book introduces readers to the benefits of a plant-based diet. The diet is based on the consumption of raw foods with a wide variety of fruits and vegetables and smaller amounts of nuts, seeds, whole grains and legumes. Brazier explains how this way of eating reduces inflammation and provides a high nutrient density in relation to calories. Additionally since all the food in the diet is healthy and non-stimulating you are allowed to eat as much as you like. However, because the meal plan is based on nutrient-dense foods it is likely that you will be easily satisfied with smaller portions. Brazier recommends eating dark green leafy vegetables every day in the form of a large salad. These foods are helpful to repair cellular damage and assist with creating new blood cells. He also recommends blending greens into smoothies. The meal plan involves consuming frequent small meals because this helps to create balanced blood sugar levels, which reduces hunger and cravings. Dieters are instructed to make gradual changes and to slowly reduce the intake of coffee and refined foods while simultaneously adding more nutrient rich foods to the diet. Brazier also advocates the daily consumption of an energy bar or vegan protein shake containing ingredients such as dates, flaxseeds and quinoa. This can be made at home from the recipes in the book or purchased from a reputable store. The Thrive Diet includes a 12-week meal plan with recipes. Raw fruit and vegetables, green smoothies, green salads, dried fruit, nuts, seeds, legumes, quinoa, avocado, green tea. Exercise is recommended for everyone as an essential component of a healthy lifestyle. Dieters are encouraged to engage in a level of physical activity that is appropriate for them and to gradually increase the intensity and duration of exercise. Brazier also provides specific guidelines on what to eat before and after exercise to enhance performance and recovery. 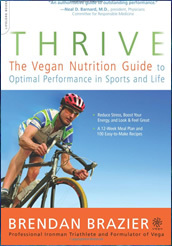 Thrive: The Vegan Nutrition Guide to Optimal Performance in Sports and Life retails at $14.95. There is also a recently released Thrive Foods, a cookbook that compliments The Thrive Diet. Plant-based diets are associated with a reduced risk of illnesses such as heart disease, diabetes and cancer. Created by a successful professional triathlete who follows this way of eating. Will appeal to athletes and physically active individuals. Encourages gradually increasing the amount of raw food in the diet. Includes a 12-week meal plan. Contains recipes for regular meals as well as sport gels and drinks. Very restrictive and requires elimination of many foods including meat, dairy, eggs, refined carbohydrates and caffeine. Will involve more time spent on meal planning and food preparation. Difficult to eat out and in social situations. The Thrive Diet is a vegan diet with a high percentage of raw foods that is specifically targeted towards triathletes, athletes, and physically active individuals. In addition to enhanced exercise performance it will promote an improvement in general health and a reduced risk of developing chronic illnesses such as heart disease and cancer.